where can i find a engineer to give e cat certificate? Thread: where can i find a engineer to give e cat certificate? i have a e cat gun safe, need to find a engineer to give the certificate, anyone know any engineer who can give the certificate? Id be interested as to what type of engineer is needed to certify it.? After all the term engineer extends to all sorts of totally unrelated things nowadays. there must be someone find a enginner who has done the certificate, anyone here know them? That would be a design thing to the rules provided by the arms officer and just signed by an engineer? To verified it was manufactured to design? Nothing structural involved in the way it's assembled? Would be interesting to see the actual design spec/limits as defined by law. i was looking at the sentry safes at H&F the other day.And am a little confused how they get around the 6mm steel plate thing for a e cat as the door on that was not 6mm more ike 3 folded to give the impression of a heavy door. I am interested to see what specs the police want in a e cat safe as I think most of the safes I have looked at seem very cheaply made. I believe the specs are outlined in Arms Regulations 1992. Last edited by P38; 02-11-2013 at 04:57 PM. locked in a steel safe or steel box or steel cabinet (being in every case a safe, box, or cabinet of sound construction and of a type approved in writing either generally or in the particular case by a member of the Police) bolted or otherwise securely fixed (in a manner approved in writing either generally or in the particular case by a member of the Police) to the building within which the pistol or military style semi-automatic firearm or restricted weapon is kept.. The highlighted bit is the reason why the difference between A and E is important. So how can any one certify a safe meets a standard that doesn't exist other than it must be steel? There has to be a design, a drawing FFS all I've ever heard is the 6 mm for E cat, is this just a lazy police near enough? Can't be? How many and what type of locking? Etc etc? Looks like I can certify it VC I'll post you a copy of my signature with a sticky 6 mm backing? 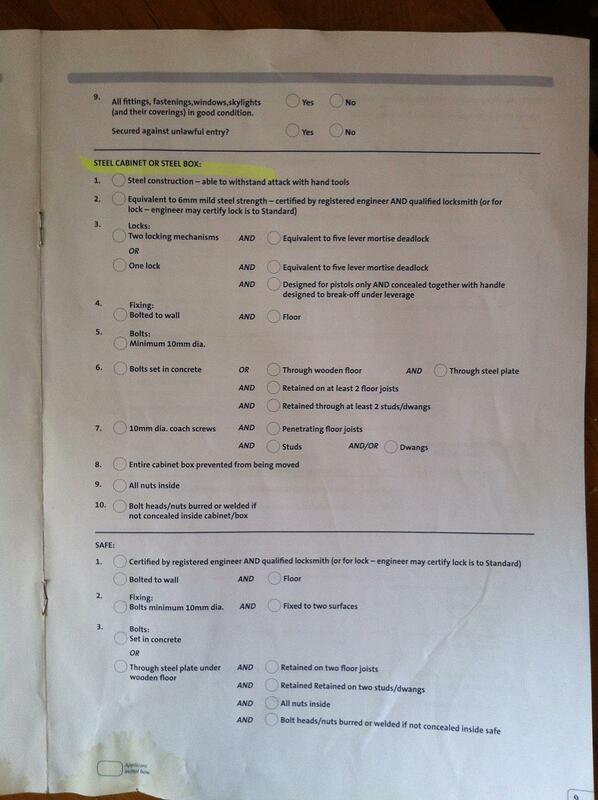 From Pol67/k (s) security inspection form NZ Police. Excellent Mikee exactly what's needed, would need to get verified by correct police authority and done! By Bernie in forum Questions, Comments, Suggestions, Testing.